Spring is finally here and summer will be ushered in before we know it. This is a great time for both people and pets to get outside after such a long winter. I know I’ve been out enjoying the warmer weather with my kids and dog every chance I can get lately! This weekend reminded me of how quickly weather can change in the midwest and it can be hard to predict just how warm it will be on any given day. It can be easy to get caught up in enjoying the warm weather and forget about the effects it may be having on our pets. We can take precautions such as moving into the shade, wearing sunscreen, and drinking water as the weather warms up. One simple warm weather tip is to allow your pet these same safe guards. If they are out with you enjoying the warm weather, make sure they have access to shade and water and apply a pet safe sunscreen if they are a short or thin haired breed. One of the most common questions we get is “How hot is too hot for my pet?” That’s not always an easy question to answer because there are so many factors in play. In general, if you’re hot, your pet is probably hotter. Dr. Kim Smyth, a Staff Veterinarian and Pet Health Writer of Petplan Pet Insurance, recently developed a helpful chart to help answer this question. The thing that I really like about it is that it takes into account some of the factors such as your pet’s size, age, breed, obesity, as well as access to shade and water. 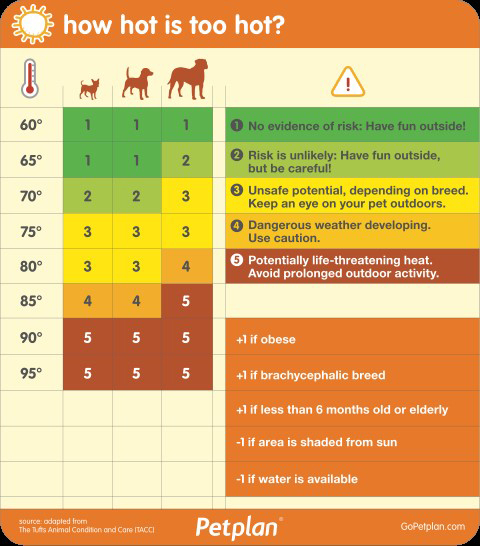 That sounds like it would be very complicated to figure out but she has actually made it into a pretty simple chart that estimates your dog’s risk of heat stroke. One last note about hot weather about pets: It is never ok to leave your pet unattended in your car. A study originally published in Pediatrics, Official Journal of the American Academy of Pediatrics looked at heat stress from enclosed vehicles. It was found that even at relatively mild outdoor temperatures on clear sunny days, vehicle temperatures rose significantly. The majority of the temperature increase happened in the first 15-30 minutes. 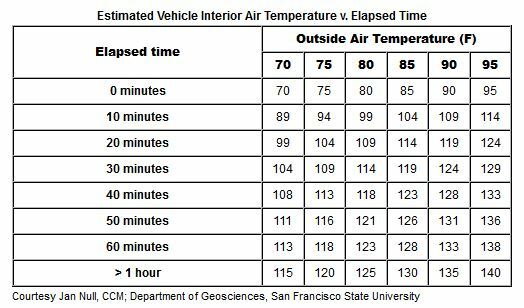 Interestingly, the study also found that cracking the windows slightly did not significantly slow down the temperature increase or decrease the maximum temperature reached in the vehicle. The following chart, found on the American Veterinary Medical Association’s website shows how high and how quickly temperatures can rise. Temperature start to rise by twenty degrees in just 10 minutes. So, again, the summary here is that it is NEVER ok to leave your pet in your vehicle unattended! Always remember to use your common sense with your pets in hot weather and if you ever have any questions, don’t hesitate to contact us!